I’m not going to say a damned word about lineaments. 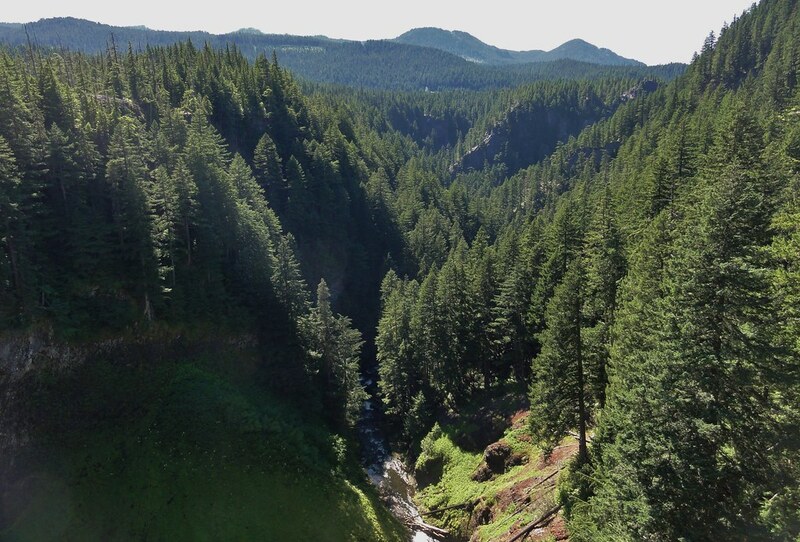 Let’s just say that traveling down Route 58 is something of an intrigue: you’re crossing the Cascades, but it doesn’t feel that way. You’re on a long, nearly straight road that doesn’t seem to go up much. Mountains rear all round you, and yet here you are, merrily zipping through them. There are some extraordinary things about the Pacific Northwest: these long, straight, bizarre structural features, some of which are barely accepted as real and others as yet only suspected, are among the most perplexing. But they’re very nice to take a road trip on. 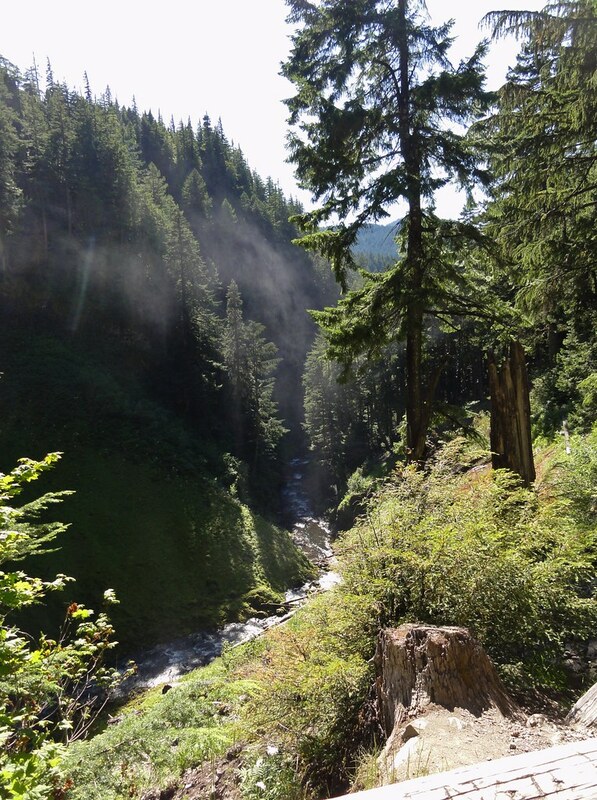 So there you are, zipping along, unfussed by steep grades or switchbacks, and then, just before you get to Willamette Pass, you’ve got this little attraction. Well, I say little. 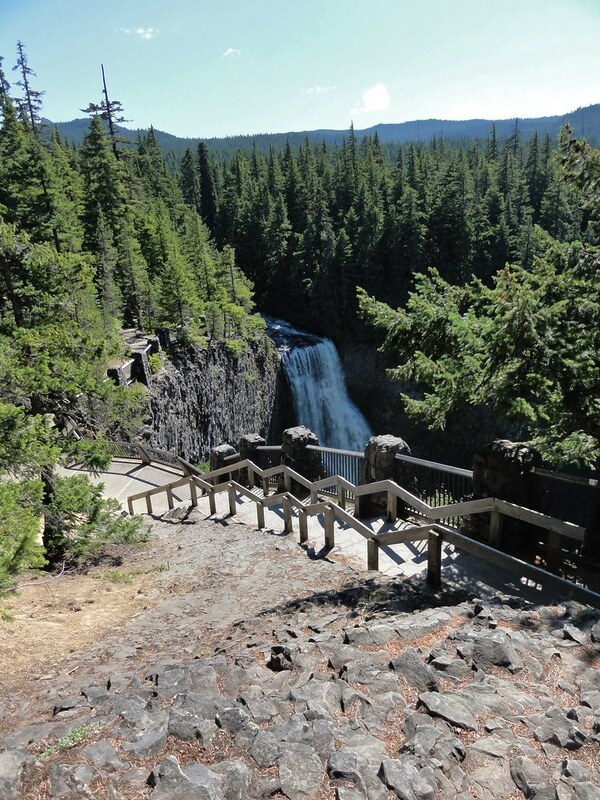 It’s only the second-highest waterfall in all of Oregon. 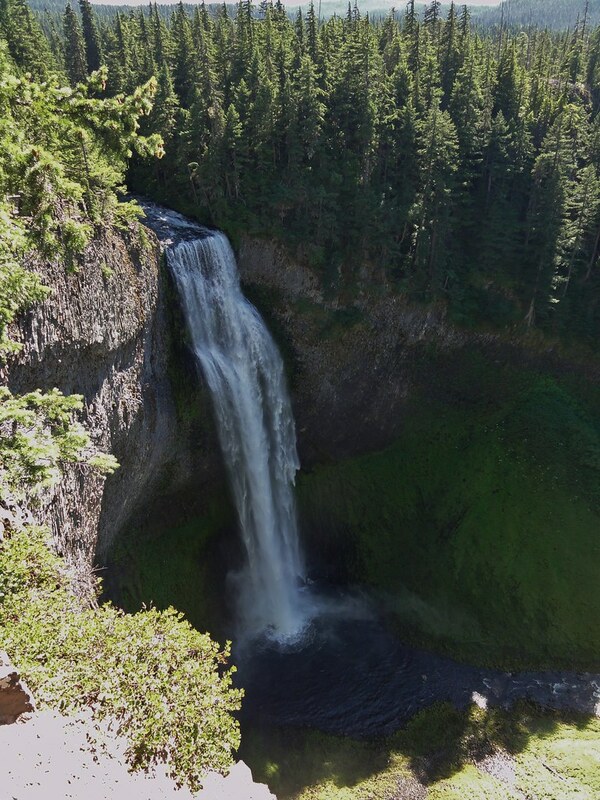 Salt Creek Falls is a marvel of falling water, but it’s not quite as interesting as the geology that surrounds it. 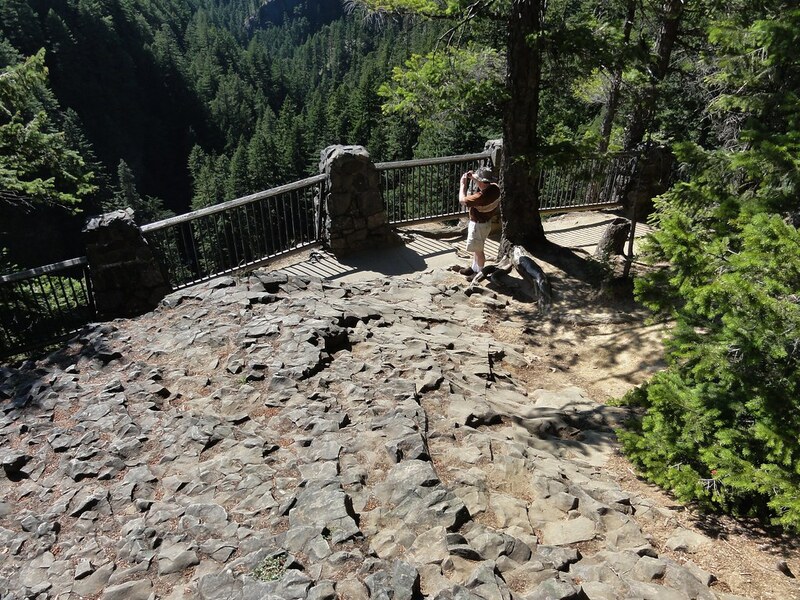 I mean, yes, tall as Niagara, “most powerful waterfall in southern Oregon,” yeah, fine. Whatevs. You know what I was looking at after having gawked at the pretty falling water for two minutes? That’s right, the rocks. There’s a story here, and it begins on a tall, bald outcrop that’ll draw a geologist’s eye faster than any amount of falling water. Okay. 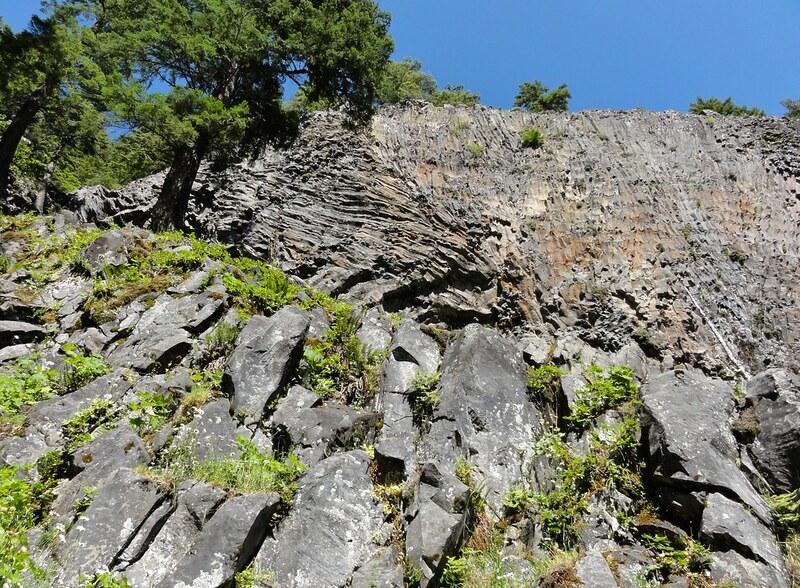 So here we have a bit of bare rock in the Pacific Northwest – intriguing enough. It’s surrounded by forest (with rhododendrons – don’t ask me why wild rhododendrons fascinate me, they just do). The trees and plants seem determined to colonize everything up to and including near-vertical cliffs, so why have they avoided this? So, if you’re crazy for rocks like Lockwood and I, you get up there to nose around a bit. You’re obviously standing on columns of something volcanic. That much isn’t hard to figure out. 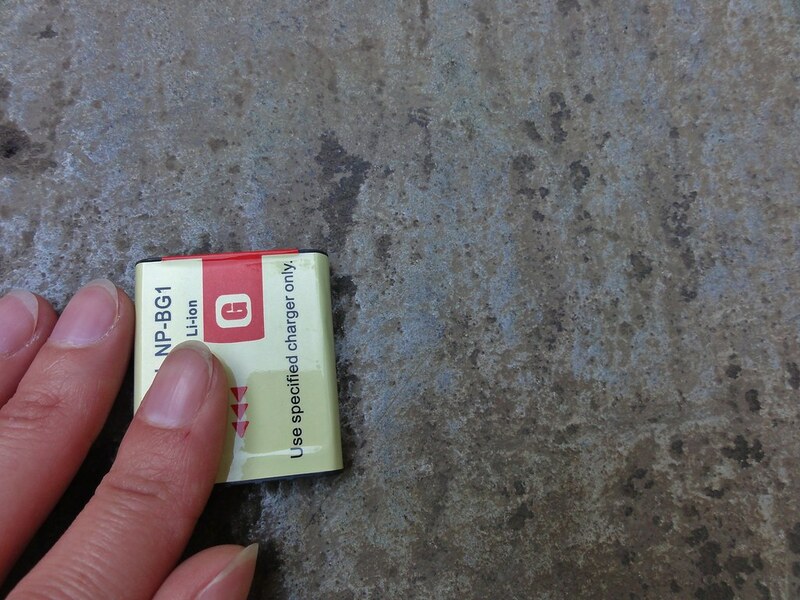 And it looks like it’s been polished by millions of exploratory feet. Could it be bald because everybody, their siblings and their friends climb up? Possibly. Though it’s hard to imagine they’d have knocked the trees down. Then there’s the idea that it got scraped clean whilst folks were building the nice paved overlook, but why would they do that? No reason. Bend down. Get your nose to the stone. Oh, it’s hard to see. Lockwood had to point it out, and then it was clear as day. That, my friends, is your classic U-shaped valley, only the creek’s carved a deep ravine into the bottom of it. But now we start to get a sense of this place. 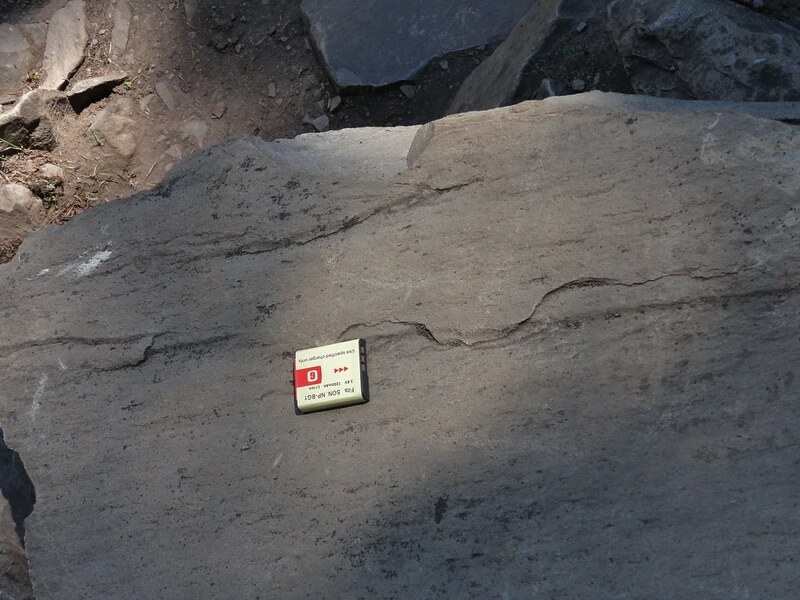 This has got the Pleistocene’s clammy fingermarks all over it. Your beautiful bald outcrop was scraped clean and bare, then polished up a bit by the glacier that carved that valley. This was a cold land, once. These were exciting times. 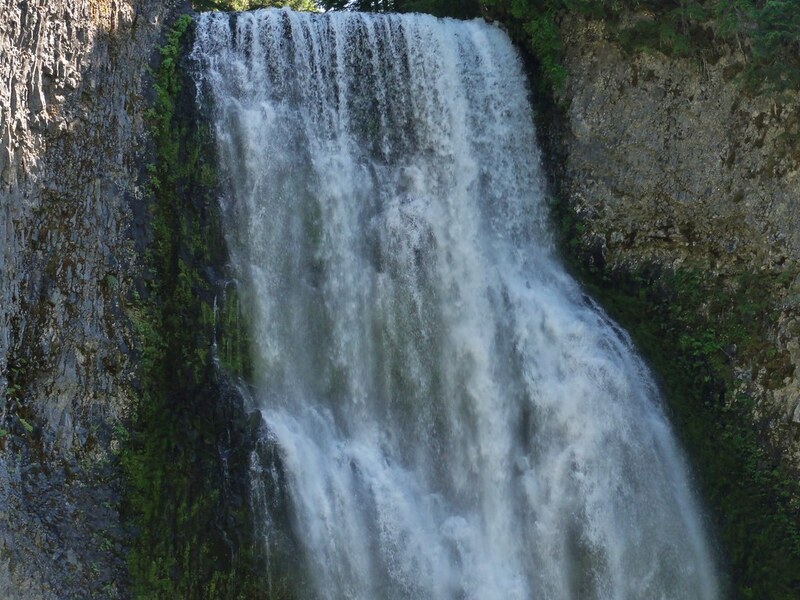 The Cascades we know today were coming into existence. And they were doing it through an ice cap that stretched all the way from Mount Hood to Mount McLoughlin, nearly two hundred miles of cold, hard ice that may have reached almost half a mile thick, busily grinding away at the volcanics. Glaciers spilled down stream valleys, plowing them from V’s to U’s. Cascades volcanoes that stopped erupting during these icy times didn’t fare well – we’ll see what happens to a volcano that goes dormant or extinct while glaciers are busy. It leaves them jagged shadows of themselves. So look at that valley again, and notice the rounded shoulders of the surrounding highlands, and how only the tallest bits are jagged, and you’ll get a sense of the power of an ice cap. Then look at the V-shaped notch there now, and you’ll begin to appreciate the power of tens of thousands of gallons per minute of water roaring through after the ice went away. This is the fate of mountains: to be ground, sliced, diced, and worn away to something more acceptable to gravity. All right. Let’s head on down the trail and have a closer look at these columns, shall we? You know, I know what you’re gonna say. “Oh, boy. 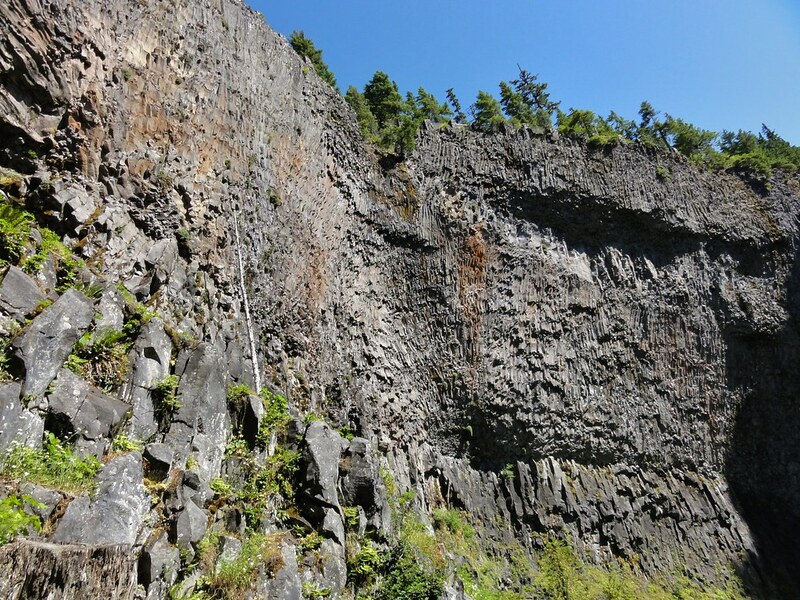 Basalt.” And yes, it’s Oregon, and yes, there’s a billion trillion tons of basalt, but in this case, it’s actually andesite. 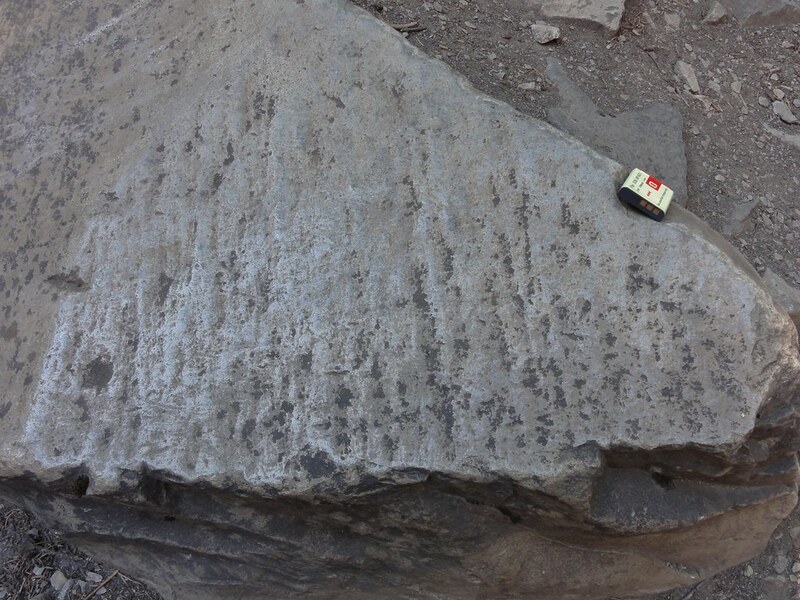 Yay, andesite! Okay, it’s andesite that kinda looks like basalt, but still. It’s more exciting! Because andesite is rather like Two-Face: it can flow very politely and quietly like basalt, sweet as Harvey Dent, or it can explode all over the place with extraordinary violence, like Harvey Dent’s worse half. 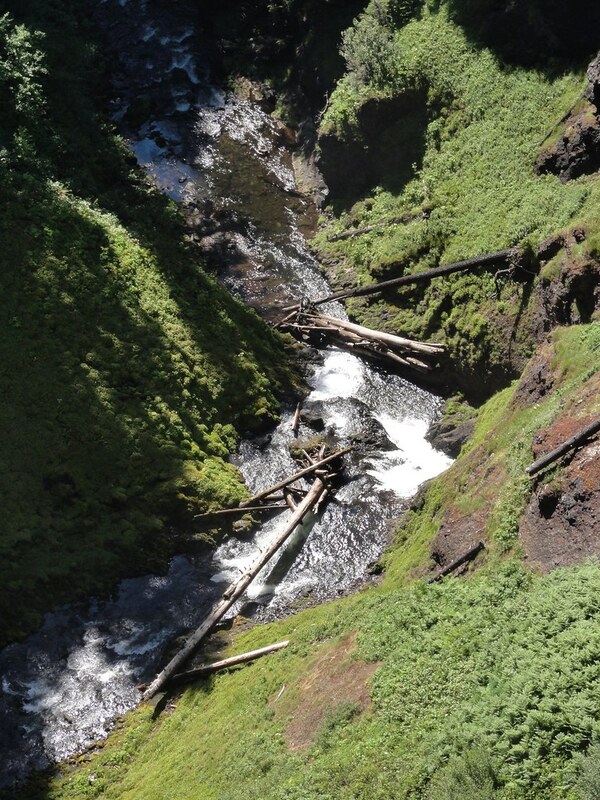 600,000 years ago, this flow added its bit to the Cascades, and cooled into the happy little columns we see today. Some of the happy little columns become crazy little columns, though. If I had a time machine and surviving-fresh-lava gear, I’d head back to see what this bugger was up to. Why did some of its columns form ramrod-straight whilst others are practically horizontal, or curved? I’d imagine it was contending with some ice round the edges, maybe some water, that caused it to cool all funny. But I could be utterly wrong. The more I study how columns form, the more confused I seem to get. But that’s all right. We’ve got a lovely valley filled with mist from the waterfall to contemplate when crazy columns make our noggins hurt. Walking that part of the trail is an exercise in caution: it’s covered with hunks and chunks of rock that have parted company with their surroundings and decided to go wading. Only they didn’t make it all the way to the creek, because they landed on the path. One caught my eye. Looks a bit striated. And what have we here, gleaming in the sunlight filtering through the trees? Why, that’s a fine example of glacial polish! Superfine. Smooth and slick to the touch, shiny as anything. Glaciers sometimes do an amazing job buffing up the rocks to a nice gleam. It’s probably a good thing this baby wasn’t sitting in direct sunlight, because the glare would’ve been like the reflection off a brass mirror. How nice is that? Too bad about the lichens. So there you have it, my darlings. 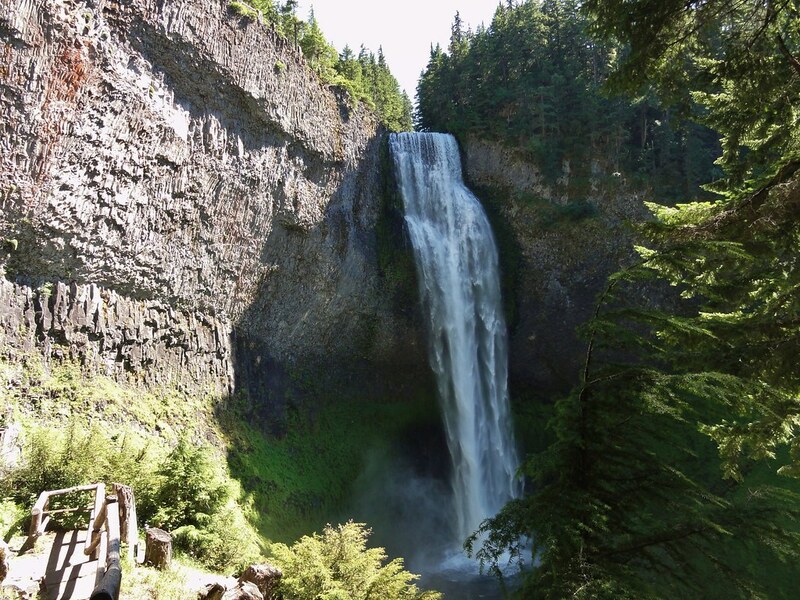 One small half-hour to forty-five minute jaunt, and you’ve got a nice waterfall, some volcanics, and a passel of outstanding glacial features to enrapture you. Not a bad place, that. Nice opening act to the later geo-dramas. Lockwood will be doing up his own bit on this lovely little location soon. Don’t miss it! In Search of Ancient Oregon – simply the most beautiful book written about Oregon’s natural history. 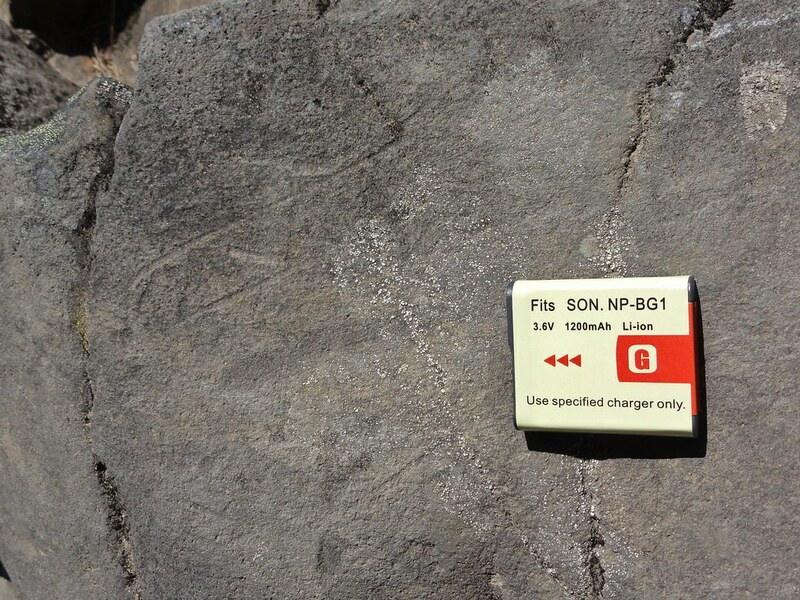 Roadside Geology of Oregon – a handy reference indeed. ← Accretionary Wedge #37: Now Available! And Sexier than Ever! 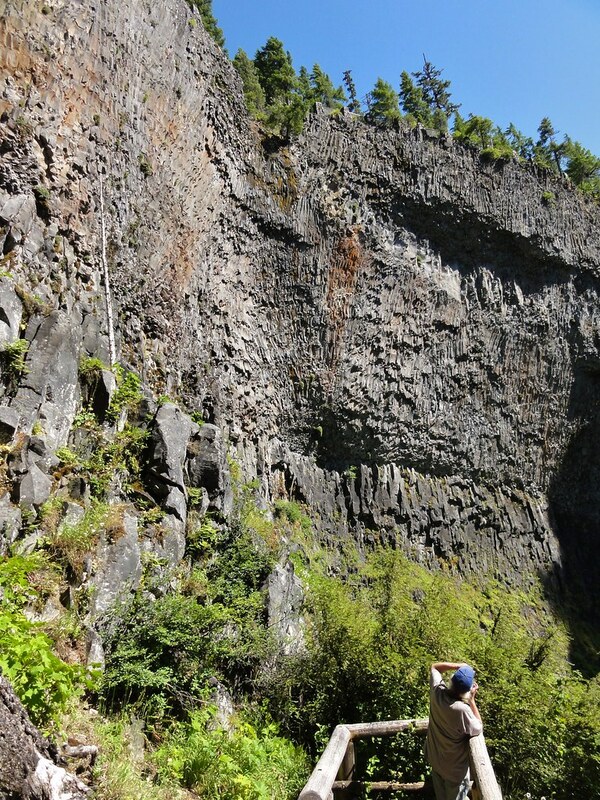 I love learning northwest geology from you! Me too!! Makes me want to hop on a plan right now and come see it for myself. Dana, here's a website you might be interested in: http://nwgeology.wordpress.com/Look for the upcoming Friends of the Pleistocene field trip in your part of the country. I've never been on a FOP field trip, but I've heard from others that they're a real kick. Very laid-back, everyone welcome. Everyone, from expert to amateur, comes away learning something new and interesting. Just watch out for the beer — the FOP folks amaze other geologists with their ability to toss back the beer.